Yikes, is Trip Hop finally making a comeback? It’s been threatening to for years, like a poop-covered boomerang: inevitable, horrible. I’ve been bracing for the squelch for a while. Oh, that’s not quite fair. Trip Hop may have been almost wholly a horrible genre, but Tricky’s early output was almost universally brilliant, or at least brilliantly obtuse. And anyway, Carroll don’t exactly make Trip-Hop. It’s just that some of their beats sound a bit like Trip Hop. Hey, it can happen to anyone. And moreover, TeaBags is a genuinely sleazy, oddball R’n’B creeper – slinking, rolling and sliding a hand up your thigh without you realising. 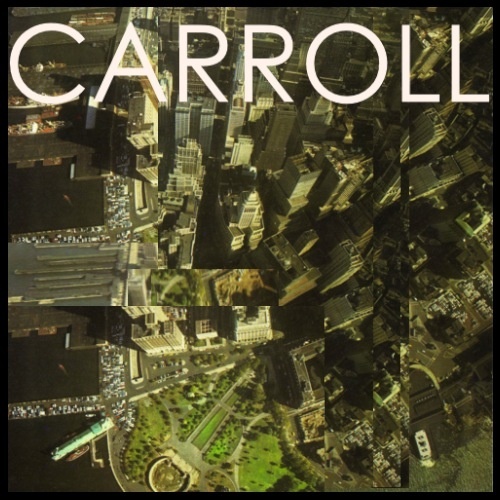 While most songs of this ilk might frustrate by getting the delicate balance between oddness and groove all out of whack, Carroll have got it just about right. And when an unexpected semi-falsetto chorus pops out of nowhere, all will seem – briefly – sunny and glorious. Nice ‘n’ sleazy does it. Posted on August 2, 2013 by Joe Sparrow. This entry was posted in Headline, Today's New Band. Bookmark the permalink. There’s what the man in the street called Trip Hop aka Morcheeba/Sneaker Pimps/Owl City aka Portishead-lite. Then there was actual Trip Hop like Tricky/Massive Attack, the early output of labels like Mo Wax, Ninja, Howie B…it was just atmospheric, usually instrumental hiphop. People’s inability to tell the difference is sort of what killed it IMO. I would say it already made a comeback sonically in the form of backing tracks for Kendrick Lamar, The Underachievers, Flatbush Zombies even Lil B. For me this track isn’t trip hop…its very good though! Agreed. This isn’t trip hop, although the drums and keys could be that if there were dreamy, reverbed out female vocals on top, instead of old-timey jazz type male vocals through an old microphone effect (bass rolled off). Amazing tune though. A true highlight for my latest playlist.